The widget is created with the signals selected in adding procedure. The user can add singals to the list from the option in the edit menu, by selecting the device, then one or all its signal. Each box shows an icon dependin on its singal type. Icons can be customized by the administrator of the profile (premium user) from the Customization section in Settings. For each signal, other than the description, the last received value followed by the last communication is displayed. It is also possible to show additonal data like the reference signals and the signals stats. By clicking a box, the corresponding signal detail page is opened. By clicking on the 3-dots icon, you access the widget menu, then, by clicking the gear, the editing modal. 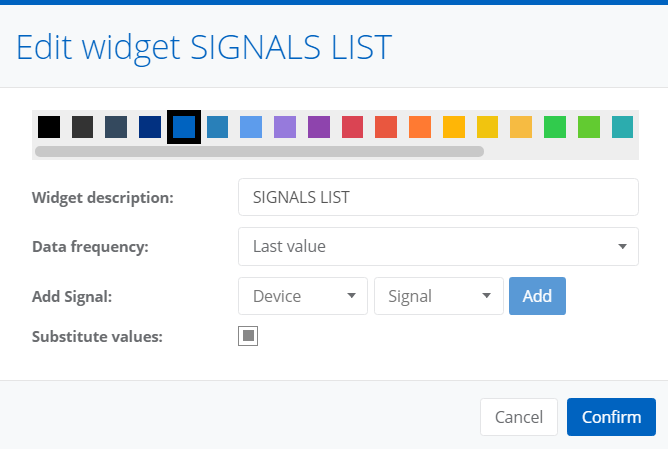 In addition to the name and color, the addition of signals, you can choose to view the signal substitutions (substitution colors are applied if set in signals settings, even if substituted value option is not set). Displayed data and reference date can also be chosen (for example, Hourly Average shows the last availabe hourly average). It is also possible to view the absolute value of a signal (if of counter type) and, if the corresponding device is correctly configured, the send commands interface. 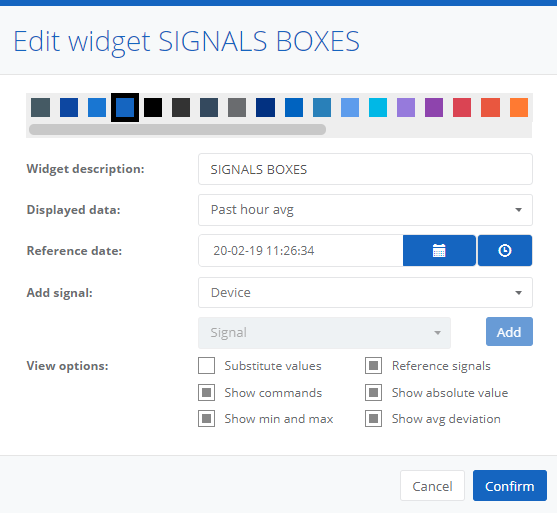 By clicking the Sort option in the menu it is possible to remove signals from the widget by clicking on the x that appears in the upper right corner of the box or sort the boxes using the drag and drop. Signals deletion only affects the widget, not the actual signal on the platform. Edits apply only if the ✓ in the header is clicked.